Jürgen Habermas is a German philosopher, who presented notable theories on sociology, religion, communication studies, epistemology, language and political-legal thought. He stands as a prominent intellectual in Germany; public polls worldwide recognize his expertise in the field of philosophy, specifically in the realm of communicative rationality and the rule of law in politics. Habermas worked extensively on foundational theories of society and epistemology, during his association with the Frankfurt School, a school related to neo-Marxist social theory. His work deals with analysis of rule of law in modern politics, especially that of Germany. Habermasian theory is devoted to rationality and its relation with communication. His renowned work includes the notion of morality in relation to rationalization theory, which was first presented by Max Weber. Habermas’ greatest contribution to the field of philosophy is his advancement in the rationality theory. According to Habermas, the greatest use of human rationality is not merely its ability to achieve a certain goal. He believes in the possibility for building a community through communicative procedures, a community which works for harmony among themselves and other- this is the best possible utilization of rationality according to Habermas’s point of view. He therefore focused on achieving an ‘ideal speech situation’, so that the masses can voice their concerns and seek solution for their problems based solely on rationality. In the domain of communicative rationality, a theory which holds human rationality as a vital result achieved through a process of successful communication, Habermas stressed on the fact that all humans are intuitively capable of reaching to mutually agreed conclusions through speech, and we should thus strive to change this inherent know-how into crystal clear knowledge, on how to conduct ourselves ethically in the field of practical rationality. 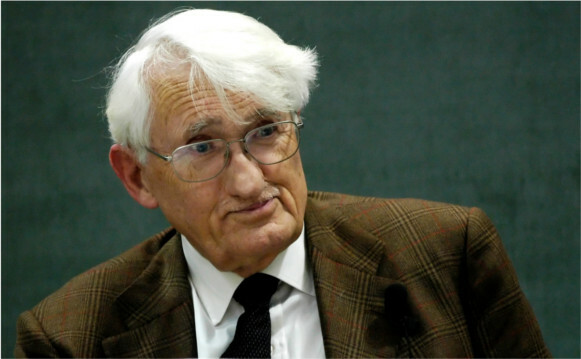 Habermas considers the development of communicative rationality as his biggest achievement, and differentiates it from the rationalists’ point of view by locating rationality in spoken communication processes, rather than in the cosmos. This theory helps in the social liberation of humans, while providing to us an adequate moral framework simultaneously. According to this social structure, all speech acts contain natural telos (Greek, meaning ‘end’) which constitutes the goal of shared understanding. Habermas built this framework through making use of social and moral theories from prominent philosophers, from Ludwig Wittgenstein, John Searle, Jean Piaget and some of his Frankfurt colleagues such as Karl-Otto Apel. This theory of communicative action was practically utilized by Habermas in law and politics, where he suggested a kind of democracy where the constitution and law is open to public discussion and suggestion. Habermas was of the belief that through this form of democracy, people will be aware of their interests in self-governance, and would become even more responsible, thus adhering only to factual and logical debates. This would give the world political situation a more humane, free and classless environment, where the potential of human intellect is fully recognized and put to good use. Habermas’ Towards Reconstructing Historical Materialism holds his views on Marxism. He held the belief that Marx’s evaluation of the human evolutionary processes as merely an economic development is an extremely limited definition, which leaves out any room for human liberty. Marx deemed progress of human societies as linear and sequential, while Habermas debates that human progress is random, dynamic and multi-dimensional. Jürgen Habermas also remained a revered mentor and teacher for several. He taught philosophy at University of Heidelberg and chaired the department of philosophy and sociology at the Johann Wolfgang Goethe University, Frankfurt. He was also the recipient of the highest German honor award, the Gottfried Wilhelm Leibniz Prize of the German Research Foundation (DFG).